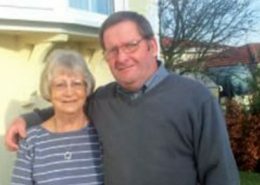 Mr & Mrs CulpeperPart exchange assistance. 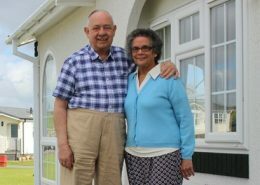 Verna and Richard Culpeper had lived in their three bedroom, semi-detached family home in leafy Harrow for thirty seven years when their daughter suggested it might be a good idea to move closer to her. As she lived on the west coast of Wales, she was worried that as they became older, with an eight hour round trip between them, she wouldn’t be able to take proper care of them. 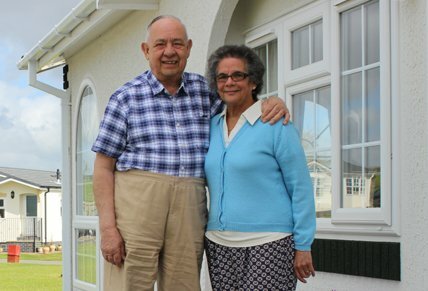 Having spent lots of time in Pembrokeshire over the years, Verna and Richard were familiar with the area, had friends and family nearby and liked the idea of being able to spend their retirement years there. 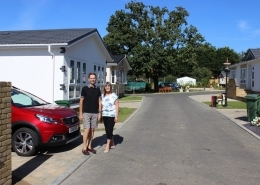 They began to look at suitable properties and dismissed their initial choice of bungalows as they were either too expensive or needed a lot of work. 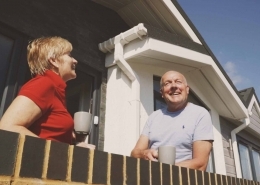 When they visited Scamford Park with a view to investigating park homes, they knew immediately that it was the place for them. 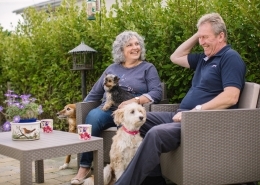 Peaceful, friendly and with stunning views over the open countryside, the Culpepers could see themselves living a fulfilling and happy life there. They could also see that the park owner, Jason Hartley, took real care over the park and its residents’ well-being. 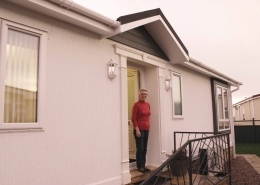 They immediately put down a deposit on the show home that they looked around, an Omar Colorado 44ft x 22ft, and put their house on the market, expecting it to sell quickly as it had a big extension, thus making it one of the best properties on the street. At first, everything seemed to be going well and they soon accepted an offer. Unfortunately, the lady who had submitted the offer then became uncontactable and eventually they had to accept that she had no intention of going through with the purchase. Undeterred, and with Jason being very understanding about the delay, they put the house back on the market. Eventually they found another buyer, but unfortunately he messed them around several times, eventually pulling out of the sale as there was no planning permission documentation for the extension, despite the fact that it had been completed 50 years previously. 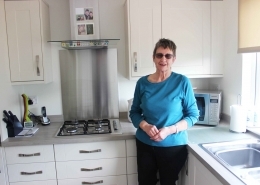 Verna explains: “We hadn’t sold a house for 37 years and needed some help. Unfortunately we felt that the estate agent was not ‘on our side’ and the situation just got worse and worse” . 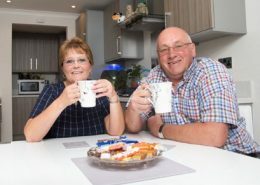 Seeing the great deal of stress that Verna and Richard were under, Jason suggested that they might like to think about using Quick Move Properties to part exchange their house so that they could buy the park home. 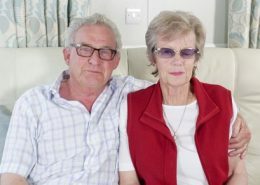 They spoke to Mark O’Dwyer who explained how the service worked and the couple were keen to go ahead with it, seeing an end to the uncertainty they had been living with. The property was valued at £370,000 and the part exchange offer was £335,000. Their son was initially worried that they may lose out on equity as, rightly so, he saw their house sale as the dictator of the amount they’d have to live on for the rest of their lives. 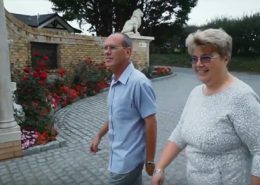 The couple says it was made clear to them right at the start that they would be selling the house at a discount from market value, and when they weighed it up, the security and peace of mind they’d get made it well worth it. Having been in their new park home for two weeks, the Culpepers have just about finished unpacking. They’ve met most of the neighbours and the couple next door even came round with flowers to welcome them. The community spirit is evident and the residents have an unwritten rule to all look out for each other. 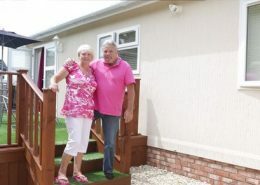 The home is spacious enough to have people come and stay and Verna and Richard are looking forward to having their friends and family come for holidays. With the beautiful Pembrokeshire coast on their doorstep, and lots of people keen to explore the area with them, it looks like they won’t be disappointed!